In a previous post I wrote about how the predicted average aircraft size by Boeing in 1990 did not match the actual evolution of that average size since then. In a more general context, how accurate are these aircraft market forecasts? Especially taking into account that they forecast along a 20-year period. Now, let’s see what was the fleet at the end of 2011. Seeing Airbus’ Global Market Forecast from 2012, the departing numbers are those of 2011 fleet. Thus, 17,171 a/c at the end 0f 2011. The GMF from 1992 underestimated the 20-year market by slightly above 2,100 or nearly 15% error. Not a bad shot taking into account the time span used. Let’s take a more recent example, this time from Boeing. In the CMO from 1997, we find the following chart showing Boeing’s forecasted fleet size and distribution for 2001, 2006, 2011 and 2016 year-ends. 1997 Boeing CMO year-end fleet forecasts for 2001, 2006, 2011 & 2016. In 2012 CMO, Boeing offered figures of 2011 year-end fleet. 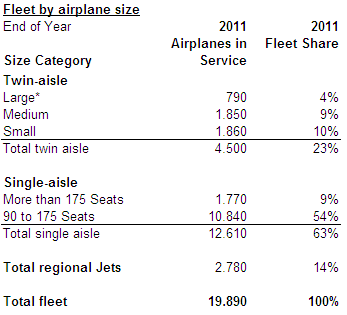 Fleet at year end 2011 according to Boeing 2012 CMO. 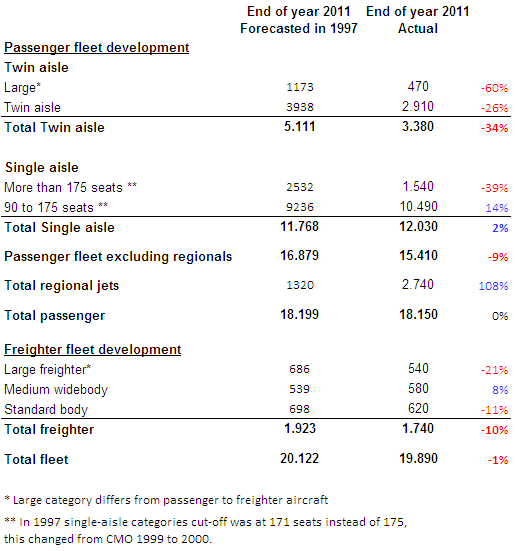 Comparison of aircraft fleet at year-end 2011: 1997 forecast vs. actual (sources: Boeing CMO 1997 and 2012). The total fleet figure was missed only by 1%. The single-aisle figure was missed only by 2%, though less larger single-aisle were acquired than expected. Where the forecast is off mark is in both regional jets (underestimated) and twin-aisle, where there are almost 1,800 less aircraft in the current fleet than forecasted… another reason for Boeing to play down on A380 segment. 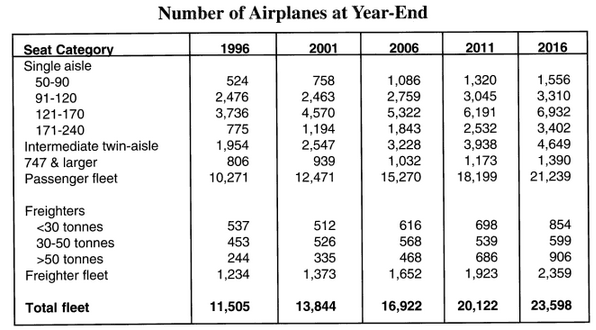 NOTE: Figures of current fleet from Boeing and Airbus differ. Some causes: Airbus does not include figures for regional jets, and definitions between large aircraft and twin-aisle vary from one company to the other. Other than that, figures for freighters are similar, 1,615 (A) vs. 1,740 (B), as they are for passenger single-aisles, 12,161 (A) vs 12,030 (B).